Add 3 More Days to Your Weekend You want more You know there's a better way to live your life. You have hopes and dreams. You want out of the box -- the financial squeeze -- living by other people's rules. The best way to achieve your goal hasn't been clear. Now there's a way. 5 Day Weekend(R) is: - More than inspiration -- It's a plan. It shows you how to build multiple streams of passive, independent income. - More than a concept -- It's real world. People's stories and cases give examples and guidance. - More than money -- It's purpose. It opens up your world to more and better choices. You can leave your 8 to 5 job behind and achieve your grandest goals. Is it time for you to get unstuck? Are you ready to move forward to a lifestyle rich with freedom and purpose? 5 Day Weekend(R) is your doorway. The strategy is to build multiple streams of income that don't require you to work 8 to 5 in a company where you have little control of your time and compensation. The core money parts -- Keep More Money, Make More Money, and Grow More Money -- focus on ways to tighten your finances, increase your income, and develop passive investment strategies. The goal is to build regular, independent cash flow until they match your standard of living. Then you're no longer captive. Your independent income is enough to sustain you -- to free you. The Personal Freedom chapters are Purpose, Choice, Productivity, Simplicity, Adventure, Peace, and Generosity -- ways to live your life to the fullest. In Power UP you Strengthen Your Mindset, Build Your Inner Circle, Fortify Your Habits, and Amplify Your Energy -- tools to support and realize your new goals. 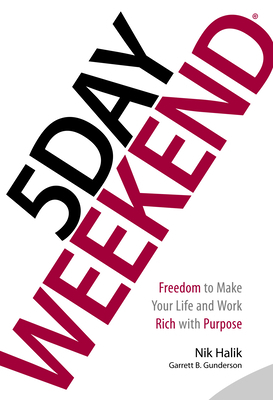 In Push the Boundaries, Nik Halik shares his remarkable journey and challenges you to achieve your own 5 Day Weekend(R). New York Times bestselling author, Garrett B. Gunderson, offers his savvy financial expertise. Nik Halk Nik enjoys his 5 Day Weekend Lifestyle with all kinds of extreme adventures. Traveling to 149 countries, he has dived to the wreck of the Titanic, scaled some of world's highest peaks, and visited North Korea. As a trained Russian cosmonaut, he was a backup for a NASA/Russian flight to the International Space Station. Nik earned his freedom by investing in real estate and founding several enterprises. He is an investor and adviser for several start-ups and a stakeholder in businesses around the world. He is a frequent speaker at conferences and conducts workshops. Nik lives in Hollywood Hills in Los Angeles and has residences in Morocco, Australia, and the Greek Islands. Garrett B. Gunderson Garrett is the author of the New York Times and Wall Street Journal bestselling personal finance book Killing Sacred Cows: Overcoming the Financial Myths That Are Destroying Your Prosperity. He is the Founder and Chief Wealth Architect of the Inc. 500 firm, Wealth Factory. A regular on ABC's Good Money, he has been on Fox, CNBC, as well as hundreds of radio interviews, and is a contributor for Forbes. Garrett is a frequent speaker at workshops and conferences. He lives in Salt Lake City.